Our brand new gaming chair will give you a comfortable experience after a long working or playing games. It makes you feel relaxation at working period and exciting gaming sessions. It has a removable waist pillow that will give you a good rest when you sitting on the chair. In addition, The chair can be adjusted to a lowered angled position for taking a quick nap. It can recline to a flat surface 90-degrees to 180-degrees and used as a bed. In addition, It is easy to move with 360 degree swivel wheels and has a retractible footrest for you to tabe a rest.Don't hesitate to buy one! Adjustable Height of Seat(from ground): 16.1"-19.7"
【Ergonomic Design】: Giantex gaming chair with footrest will give you a comfortable experience after a long working or playing games. It makes you feel relaxation at working period and exciting gaming sessions. 【Comfortable Gaming Chair】: Made of Scratch-resistant PU leather, Fulfilled with Sponge added more comfortable when sitting on the chair for a long time, also with waist pillow for relax. Have special textilene surface on seat and back, it will make the chair aging resistant and breath freely. 【Easy To Move】: 5 Universal casters for multi-direction wheels which can move smoothly on floor, you could swivel at 360 degrees. 【Adjustable Recline Chair】: The chair can be adjusted to a lowered angled position for taking a quick nap. It can recline to a flat surface 90-degrees to 180-degrees and used as a bed. 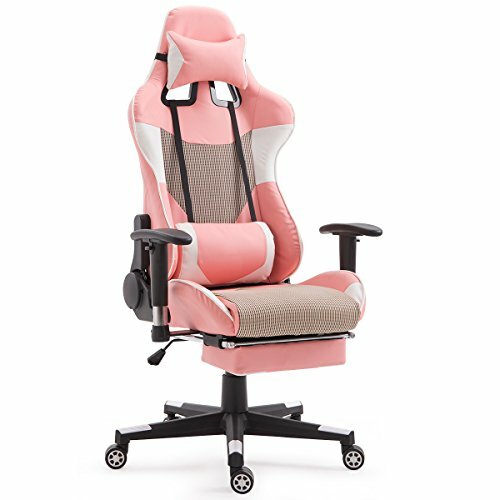 【Easy To Use】: Adjustable seat height with handle, Adjustable Height of Seat(from ground): 16.1"-19.7", need easy assemble according to the instruction, very suitable to use this gaming chair in daily life.